Before we begin, locate the 5-digit factory code located on the back of your owner's manual, and enter the code to open the door. This safe is set to "62044." To program the primary-user code, press the [P] button and enter the 5-digit factory code on the electronic keypad. The green proceed-light will flash green, then you will have five seconds to enter your own personal 5-digit user code. In this case, we will use "12345." When the green proceed-light flashes, your primary user code has been saved. To program the secondary user code, press the [P] button two times, then enter the 5-digit primary-user code on the electronic keypad. The green proceed-light will flash green. Then, you will have five seconds to enter your own 5-digit secondary user code. In this case, we will user "56789." When the green light flashes, your personal secondary user code has been saved. Please note the [C] button is a "clear" key. This can be used at any time to clear the system and start over. Be sure to test your new user codes several times, with the door in the OPEN position, prior to closing and locking your safe. To delete the secondary user code, press the [P] button two times, and enter the 5-digit user code. Immediately after, enter "0-0-0-0-0" to delete the code. To delete the primary user code, press the [P] button once, and enter the 5-digit factory code on the keypad, and enter "0-0-0-0-0" to delete the code. For additional how-to videos, please visit SentrySafe.com. Follow these step-by-step video instructions to use the electronic keypad to program, test, or delete your SentrySafe Fire Safe's primary and secondary user codes. SentrySafe SFW205BPC Black 1 Hour Fire and Water Safe with Biometric Fingerprint Lock and Keypad - 2 Cu. Ft.
SentrySafe fire safes are shipped with a shipping screw inserted into the door to prevent them from locking during shipping. 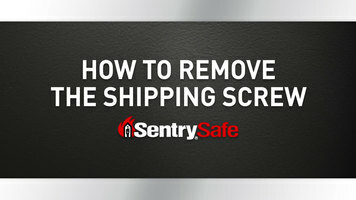 Check out the video for step-by-step shipping screw removal instructions, and ready your safe for immediate use. 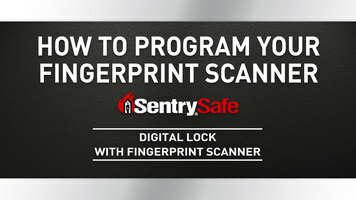 Follow these step-by-step video instructions to programming your SentrySafe Fire Safe's fingerprint scanner function. SentrySafe safes equipped with the fingerprint scanner function can be programmed to register primary-user fingerprints, in addition to the fingerprints of other users will be granted access to the safe. Choose SentrySafe fire safes for unmatched protection of your important documents and keepsakes. UL-approved to withstand up to one full hour (approximately 1700 degrees Fahrenheit) of fire exposure, SentrySafe fire safes provide a level of fire-resistance that excels above other competitive safes. 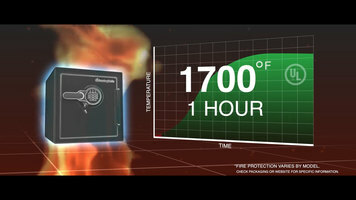 SentrySafe fire safes also provide an excellent defense against water intrusion.